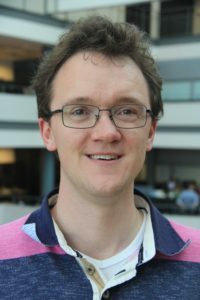 Freddy Rabouw develops advanced optical microscopy and spectroscopy methods on the single-molecule level to study individual reaction events with high spatial and temporal resolution simultaneously. The current focus is on model reactions in which fluorescent molecules change color. Nano Letters, 19 (1), pp. 108-115, 2019. ACS Nano, 12 (11), pp. 10576-10577, 2018. Physical Review Letters, 121 (11), 2018. ACS Photonics, 5 (8), pp. 3353-3362, 2018. ACS Nano, 12 (5), pp. 4812-4823, 2018. Nano Letters, 18 (2), pp. 1028-1034, 2018. Advanced Functional Materials, 27 (45), 2017. Journal of Physics B: Atomic, Molecular and Optical Physics, 50 (21), 2017. ACS Nano, 11 (9), pp. 9136-9142, 2017. Nature Communications, 8 , 2017. Nature Materials, 15 (12), pp. 1248-1254, 2016. Nano Letters, 16 (11), pp. 7254-7260, 2016. Topics in Current Chemistry, 374 (5), 2016. Journal of Physical Chemistry Letters, 7 (17), pp. 3503-3509, 2016. Nano Letters, 16 (4), pp. 2608-2614, 2016. Nano Letters, 16 (3), pp. 2047-2053, 2016. ACS Nano, 9 (11), pp. 11430-11438, 2015. Nano Letters, 15 (11), pp. 7718-7725, 2015. ACS Nano, 9 (10), pp. 10366-10376, 2015. ACS Nano, 9 (8), pp. 7840-7845, 2015. Physical Chemistry Chemical Physics, 17 (26), pp. 16959-16969, 2015. ACS Nano, 9 (4), pp. 3942-3950, 2015. Journal of Physical Chemistry C, 119 (5), pp. 2364-2370, 2015. Chemistry of Materials, 27 (2), pp. 621-628, 2015. ACS Nano, 9 (2), pp. 1801-1808, 2015. Advanced Optical Materials, 3 (4), pp. 558-567, 2015. Light: Science and Applications, 4 , 2015. Journal of the American Chemical Society, 136 (47), pp. 16533-16543, 2014. Physical Review B - Condensed Matter and Materials Physics, 90 (16), 2014. Journal of Luminescence, 146 , pp. 302-306, 2014. ACS Nano, 8 (10), pp. 10486-10495, 2014. Science, 344 (6190), pp. 1377-1380, 2014. Nano Letters, 13 (10), pp. 4884-4892, 2013. ACS Nano, 7 (7), pp. 5984-5992, 2013. Optical Materials, 35 (7), pp. 1342-1347, 2013. Nano Letters, 12 (11), pp. 5515-5523, 2012. Materials Letters, 80 , pp. 75-77, 2012.